There seems to be some misinformation out there that flashbacks will always happen and that people just need to learn coping skills in order to manage them more effectively and make is so that they are less of an issue in life. I suppose that is improvement, but my clients want their flashbacks to STOP entirely. 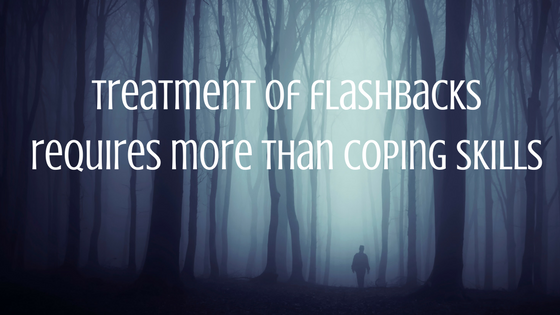 Coping skills are a great FIRST step in the treatment of flashbacks, but it doesn’t END there. Unfortunately many clients don’t continue to seek treatment because they have all the coping skills but continue to struggle and assume that it won’t ever get better and that it is as good as it’s gonna get. This is not true. Trauma treatment is NOT about symptom management, it is about complete healing. How do you treat flashbacks with your clients? After my clients have coping strategies that are helpful in working through distress, it is time to dig deeper into the root of the issue where the problem REALLY lies. In the therapy office, my clients learn how to explore and understand different aspects of themselves. They learn to understand the function and behavior of all of their defensive systems that have been put in place unconsciously so that they could go on with their normal lives during and after a traumatic event or traumatic period of life. Flashbacks happen when there is a trigger and the internal systems gets in disarray and some parts are taking the stage to attempt to get the help that they need. Once we understand more and more about the internal workings of this defensive system we can begin to work with the different parts in order to validate, calm, and treat the trauma. This results in the system becoming increasingly stable – no grounding skills needed at this point. (not that they can’t be used). As treatment continues and the internal system becomes more stabilized and aware of what is actually happening, we can then move into trauma reprocessing (via EMDR) and completely heal the trauma so that it no longer results in flashbacks, yet becomes just a memory of an event that happened. Getting to this point in treatment is entirely doable, although it may take some time. I write this piece to encourage you that becoming fully healed is possible. You don’t have to just manage with coping skills the rest of your life. You don’t have to keep relying on medications in order to sleep at night. When these flashbacks are healed and your system is able to calm, you will be able to sleep without taking a pill. And it will be the best sleep ever because medicated sleep feels different than non-medicated sleep. I’m not saying medications are bad – they are needed to get through until healing happens – but you don’t need to rely on them for the rest of your life.